This doll had almost been loved to death. You know, love inflicts the most terrible injuries on my small patients. Creative Director Steve Fuller (Mad Men, The Pacific) discusses the opening titles for Bunny Lake is Missing. Saul Bass's work always looks effortless and timeless. That's what makes his work so appealing – it can be enjoyed on a basic level. Like a child seeing simple shapes and colors for the first time – a white line on black paper. Maybe there's something soothing about that simplicity next to the visual chaos of the world. 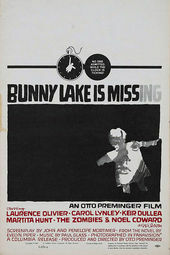 One of the best examples of a simple yet smart Saul Bass idea is the main title sequence for Bunny Lake is Missing. The film is about an emotionally disturbed person involved in the disappearance of a child. To hint at the character's state of mind, a hand tears shapes out of a black screen, each hole revealing another credit. The torn edges are jagged and help to set the mood of the film. It ends with the shape of a girl being torn out of the paper, as if she's missing from the sheet of paper (which is then used again in the poster). It seems like such a simple idea but getting there is difficult. It takes years of experience to have the ability to boil ideas down to this kind of purity and Bass didn't muck it up with anything he didn't need: no color, no jumpy edits, no tricks. Just the raw, naked concept standing on its own. You can see this same approach time and time again in his work: great ideas condensed down to their purest form, then simply executed. It proves that basic shapes, colors, and compositions in the hands of an experienced artist can become something magical. You could compare him to Matisse, who spent his entire career as an artist refining his style over 50 working years and ended up cutting simple shapes out of painted paper in his later years. He made some of his best work at the very end of his life. But all those years of experience were necessary for him to cut those shapes just right. Saul Bass was at that same level in the design world. Look at the title sequence to Psycho. Matisse would have loved it – Bass did it all with just rectangles.